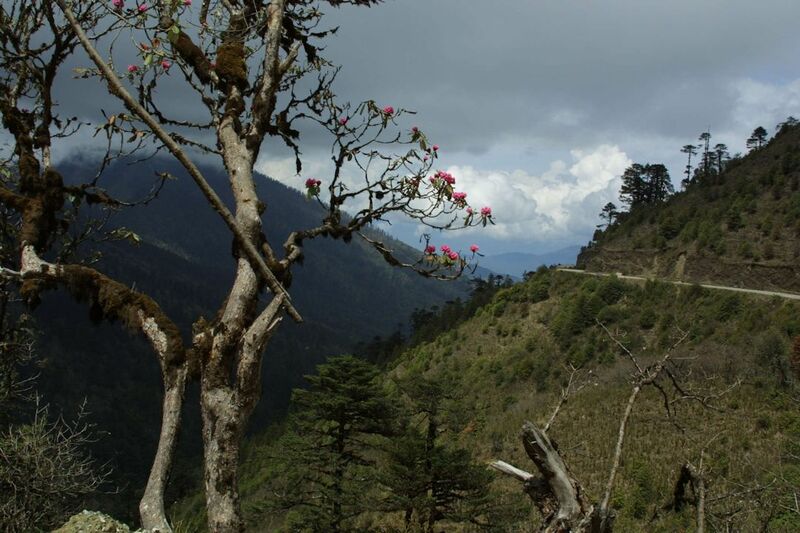 Bhutan is clearly not a place most people have put on their bucket list. The first two questions people asked us when they heard we were going to Bhutan were "where is it?" and "why do you want to go there?" Where it is is between India on the west, south and east and Tibet to the north. 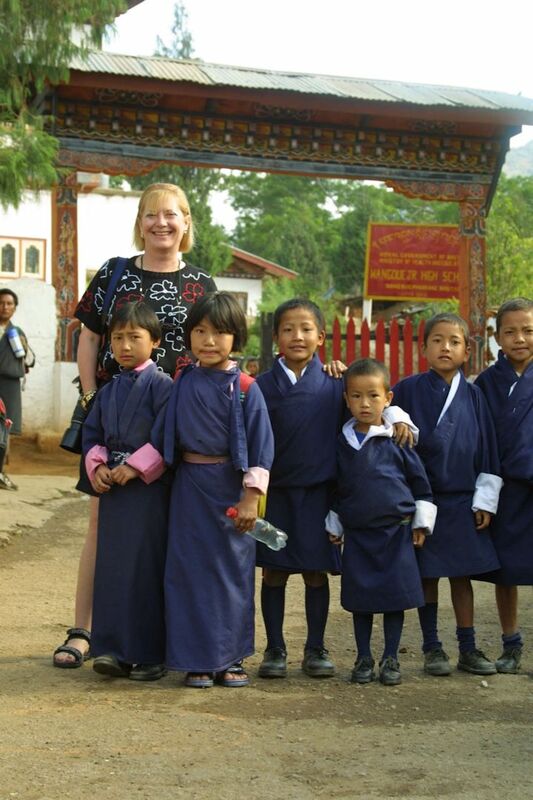 We decided to go to Bhutan because some close friends of ours, totally fearless travelers, had highly recommended it. We began the planning early in 2001. And the information on the Internet made it look like our kind of place. 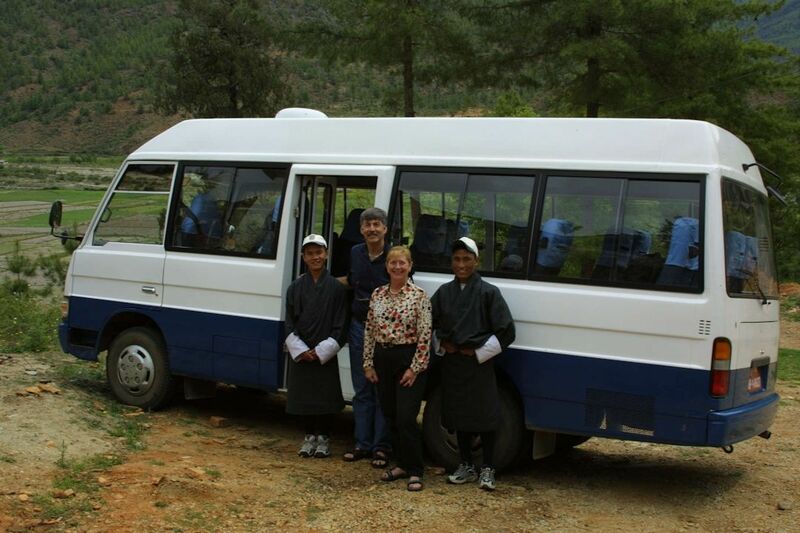 One of the things that makes Bhutan different is that you are required to travel under the auspices of an approved tour operator and that means with a guide. You just don't go bumming around Bhutan. At that time there were some 80 approved tour operators so there was much to search through. So, we did a lot of Internet searching. And Mike had arrived at Rainbow Tours & Treks because of their courteous and informative replies to e-mails. When Mike checked with our friends and found out that they too had used Rainbow Tours & Treks, it was set. Getting into Bhutan is tightly controlled requiring you to either fly in or fly out on Druk Air, the country's airline. We refer to it as an airline but at that time they had only two planes. So, you have an option of entering or leaving through India by some other means. However, while you can drive out by car, you cannot drive in without a tour guide. Because of all of this, there are not many tourists. In 1997, for example, just over 5,000 tourists entered the country and the numbers in the coming years were not expected to increase greatly. And, at something around $200 per person per day, plus a surcharge if you are traveling in a group of less than four people, you don't see the backpacking set in Bhutan. And as with most monopolies, Druk Air is not cheap either. When we went you could only fly into Bhutan from four basic places, Bangkok, Kathmandu, New Delhi, and Calcutta. Given that our last trip had been to Nepal, we had little interest in repeating our experiences of flying into and out of Kathmandu. And going through India was way out of our way. So, Bangkok it was. But then again, we love Bangkok. Actually, and no surprise here, there are other considerations. You can fly into Bhutan from Delhi and Kathmandu on Mondays and Thursdays and from Bangkok and Calcutta on Wednesdays, Fridays and Sundays. Flights leave Bhutan for Delhi and Kathmandu on Mondays and Thursdays, and leave to Bangkok and Calcutta on Tuesdays, Thursdays and Saturdays. They also warn you that during monsoons, unpredictable weather can delay flights and travelers are advised to include an extra day in their itinerary. You can see the difficulty of planning connecting flights and hotel reservations. This is definitely a trip for the fearless traveler. Now then, when we started to book this trip, we were informed by Sonam, Rainbow's Internet contact, that there were no seats available on the flights we wanted but we could be put on a waiting list. So we asked about business class and were told that they were able to get us seats on that flight in business class, a flight from Bangkok into Bhutan and back a week later. Getting seats on Druk Air, it turns out, is a very iffy proposition and not to be overlooked. It's hard to plan a trip and commit to connecting reservations and the tour when you're wait-listed on the last leg. It turned out that Rainbow's agent in Bhutan had gone directly to the airport and persuaded them to put us on that flight. Once you have your flight, you can then book the tour. Now in Bhutan, there is a west, a central and an east. And all are connected by the same road. So you go out and come back the same way. That suggests that you would want to fly into the airport at Paro in the west, drive across to the east, and exit into India. 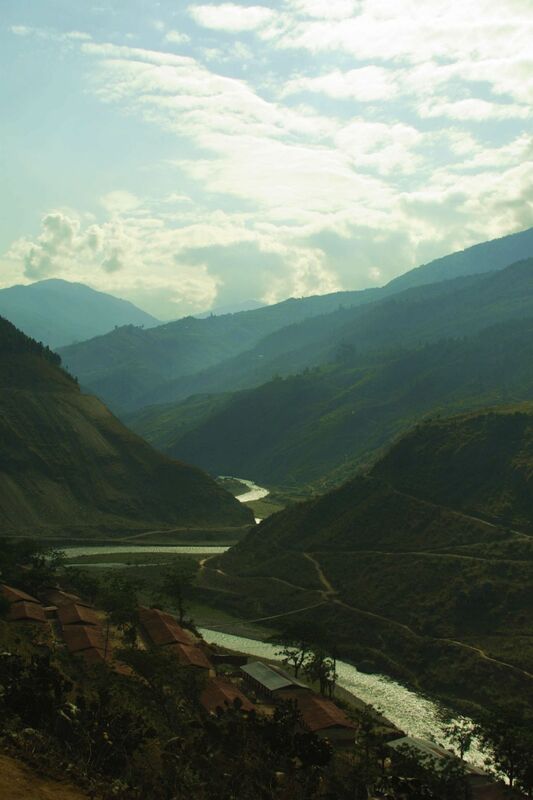 Unfortunately, it is a very long and very slow drive on marginal roads from central Bhutan to the east, conditions are described as primitive, and there is not a lot more to see. So, concentrating on western and central Bhutan is a no brainer unless you have a lot more time and are truly a road warrior. Flying into Bhutan starts out easy enough but you soon notice that there are very large mountains in front of you. And the next thing that you notice is that you have begun flying between the peaks of those mountains. But all this pales in comparison to the landing. Basically coming in over Paro, the airplane has to circle within the valley to get low enough to land. And this puts you very close to the mountains before you start the landing. I commented to Katherine as we came in that this was more harrowing than landing at Kathmandu. Right after that Mike hears the guy behind him tell his seat mate the same thing. It turns out that other airlines have been offered flights into Paro but after their pilots check the landings out they change their minds. So, we land at Paro, get through customs and are met by our intrepid guide Sim Drup and our driver, Ten Zen. Both turned out to be not only knowledgeable but very entertaining. And, happily, Sim Drup's English was excellent. Actually, Ten Zen spoke good English but was very shy. And they both wore the required uniform. The Bhutan government has decreed that all Bhutanese in temples, government buildings, or in any public places must wear the traditional attire. For men, this is a Gho. It is a sarong-like coat that looks somewhat like a colorful bathrobe. It's essentially a full length jacket over a blouse-like shirt with the sleeves folded back to form a large, white cuff. They then belt it with a sash and pull it up to make it knee length. They also wore knee-length socks and laced leather walking shoes. Actually, when we were traveling, they both wore tennis shoes, but these were changed as soon as we arrived at our destinations. So, off we go for the 20 minute drive to the Denchen Cottages, our hotel, in a 16-passenger van. We had booked the trip for the two of us so we would have a guide and driver to ourselves. They only had a couple of vehicles and Ten Zen, their best driver, preferred the van. So we had a lot of room to move about. This turned out to be a major advantage on the long drives. Time to check in, have a bite to eat and then go out to see Paro. Because your trip is entirely in the hands of the agency handling your trip, in this case Rainbow Tours & Treks, all of the hotel arrangements are made by them. It does not make a difference in the price of the trip. It is mostly related to the pull of the agency as to how good your accommodations are. This turned out to be something of a problem in one town, as we'll note later. But this hotel had a lovely view of the city and, though accommodations were a little rustic compared to what we have become used to, the room was adequate. We also discovered that there is a national bed. It is a wood-framed bed with a four-inch piece of foam rubber lain on a wooden base with a heavy quilt on top and a very hard pillow. You get used to it. However, walking back to the van for our afternoon tour, Sim Drup told us not to expect such a fancy hotel anywhere else on the trip. This gave us both a little pause. You quickly get the idea that not a lot of money goes into road construction. The roads are generally only wide enough for one-way travel with one or the other of the converging vehicles having to pull onto the shoulder to let the other vehicle by. 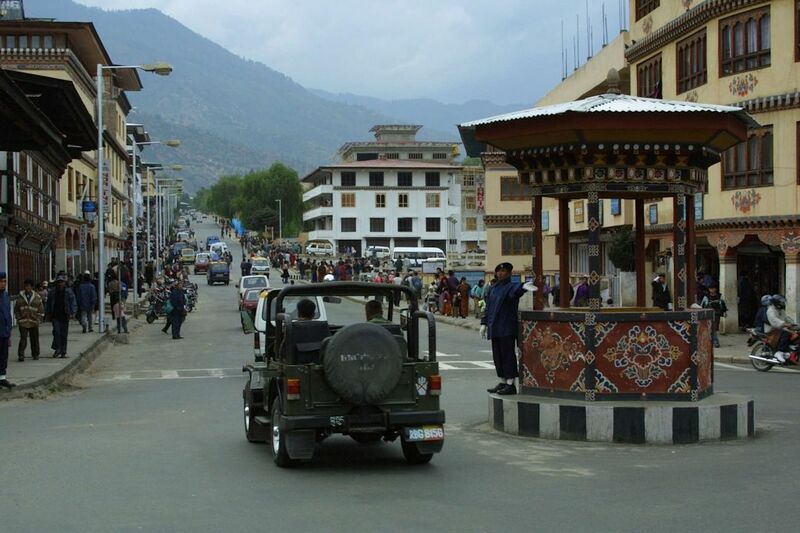 The good news is that there aren't a lot of cars in Bhutan. Actually, the roads in Paro were good compared to those we were to travel over the next seven days. There is not much to Paro's downtown, all three blocks of it, and, given that the weather was cool and cloudy, we decided to skip the downtown tour until we returned to Paro before the flight back to Bangkok. We toured some of the ancient ruins, learned a little local history, walked through the Paro Dzong, which is quite impressive, and then returned to the hotel. One of the novel things Mike noticed was the local car wash. People simply drive their car onto the gravel bed of the Paro river, soap it up and rinse it off. A little cold but convenient. However, judging from the width of the riverbed, this is something you don't do during the rainy season. Unlike so many other places we've been, we noticed a lot of dogs running lose, all mongrels, but not the 'common denominator' dog we are used to seeing. Being Buddhists, they do not kill anything so the dogs simply coexist with the people. You may be very dismayed at the condition of some of the dogs we saw, but that is life in Bhutan. Money is not something they would waste on a sick dog. Dinner at the hotel, like lunch, was excellent and gave us an indication of the food we were going to get throughout the trip. 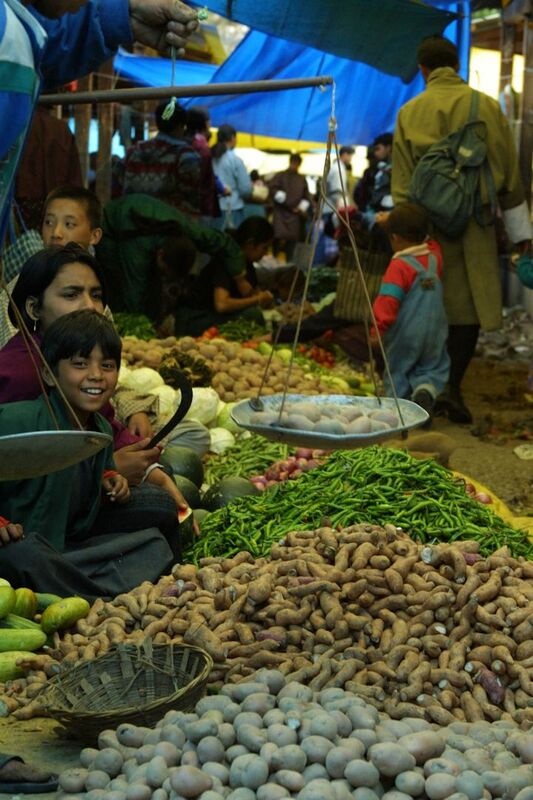 First, the national vegetable is a chili and the national dish is chilies and cheese with Yak butter. And they put chilies into just about everything. So, you had better like spicy food. We do, and it was great. Mike's favorite was the potato and chilies served au gratin, which came with just about every meal. They eat a lot of vegetables and particularly asparagus. Now, while Katherine loves asparagus, it is the one vegetable that Mike will not eat. It's a long story. They also eat tons of rice. Literally. They are among the top consumers in the world, way above China and Japan. And they like Yak meat. The national drink is butter tea. Butter is heated with an egg, cooking the egg, and and it is put in the bottom of a cup, and tea added. It is incredibly rich and definitely an acquired taste. And if you aren't prepared for the egg at the bottom, it can be a bit of a surprise when you come across it. They also drink a lot of an alcoholic drink called Ara. It is usually a wheat-based brew, and it seems that just about everybody brews their own. This meant that one, it is potent and two, the quality varies from marginal to terrible. It, too, is a drink that you have to acquire a taste for but Mike felt the Ara made the butter tea tolerable. In Jakar we visited the home of our driver and his mother, who is in total charge of brewing the Ara, and was very proud of her product. She insisted that we have some Ara which I can assure you has a kick. It is a curious anomaly that being Buddhists, killing of animals is not accepted. However, if your cow falls off a cliff and dies, so be it. You would now be blessed with meat. Actually many of the dishes are vegetarian and Mike realized after some days that he had not eaten any meat at dinner. That was because Mike thought the meat was tough and fatty, things he hates; Kath thought it was very flavorful. Anyway, most of the meals are served buffet style. And a lot of tourists opt to skip the Bhutan food to eat blander and more typical foods available at the buffet. However, we immediately took Sim Drup aside and told him that we loved hot food and wanted nothing but local dishes. Hey, part of the adventure is to eat their food and, while we are sometimes surprised, we are rarely disappointed. So, by and large, we always had items made especially for us by the chief. And they were great. Bhutanese food is very much like Indian, but typically hotter and using more of their chilies and lots of cheese. Their cheese is a processed cheese and relatively bland. Given that we love Indian, this was great. Actually, Sim Drup did us one last favor when finally returned to the hotel. He arranged for Katherine to watch the chef prepare the dinner. And she loved it. Beer is available, which makes sense given the hot food, and drunk mainly by tourists and business travelers. Unfortunately, it is frequently severed at or near room temperature. They don't have a lot of refrigerator space and beer is not going to get it. We did learn to avoid Black Label beer. Even the locals would not drink it. Mike figured that they only sold it to tourists. 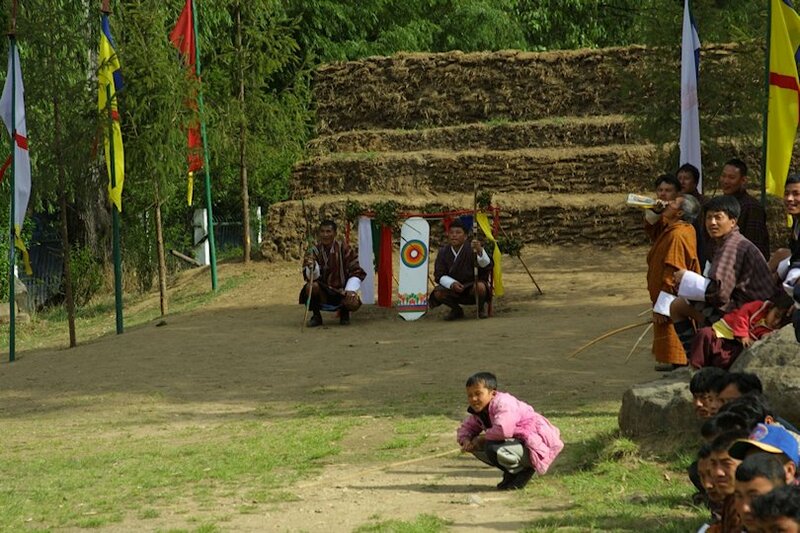 Late that afternoon, we began to experience some of the novelties of being in Bhutan. First, there were the flies. They were pretty much everywhere. Why? Because, being Buddhists, they can't kill flies. So, Mike's disposing of those near him had to be done surreptitiously. However, the loud smack of the newspaper on the wall did draw some attention. Actually, although we didn't experience them, disease carrying mosquitoes are a problem in some areas also because they can't kill them. They are attempting to work this dilemma out. The other oddity was the wind. Seemingly out of nowhere, really heavy winds just start up. Pretty much at the same time every day, we were told. And, we had thunderstorms pass just as quickly. The next day we were up very early to be able to hike up to Tiger's Nest, a monastery built way up on the mountain. Indeed, it is one of the most recognizable landmarks in Bhutan. And there is a lot of history associated with its past that your guide will delight in telling you about. Unfortunately, a large part of it burned down a few years ago and so it was in the process of being rebuilt. Now the hike up the mountain begins easily enough but we had forgotten that we were at 7,000 feet. And, having flown in the night before, we had had little time to acclimate. So, by the time we had climbed up to the viewing area, a climb of several hours, we were more than a little pooped. But the views were beautiful. However, you also find out that the walk back down is much harder on your legs than the walk up was. Tiger's Nest should not be missed. However, don't bother to go if the weather is not good. There will be nothing to see and, God forbid, you have to walk on a narrow, wet path. 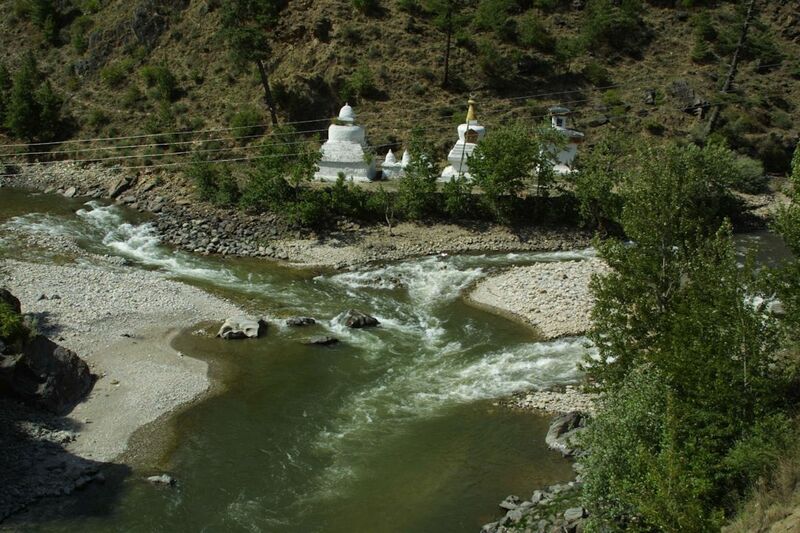 You will probably be in Paro one day at the beginning and/or end of the trip. So, if the weather is good when you arrive, go. If it's not, catch it on the way back. 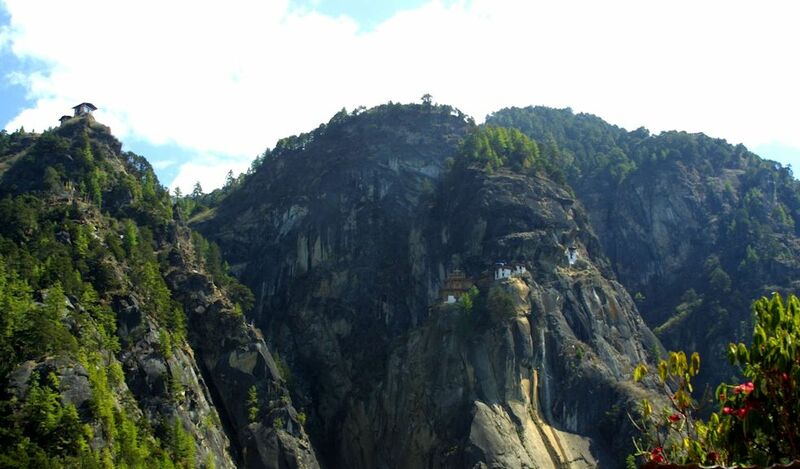 Many people spend no more time in Paro than necessary to go to Tiger's Nest but it is a nice place to stop over. Now, it seems that every country uses another, cheaper labor force to do a variety of labor-intensive jobs. In Bhutan it is the Indians. They are brought in to do all of the construction work, and other work that the Bhutanese don't want to do, or can't do. Except the cooks. Here everybody concedes Indian cooks are the best cooks. Which brings up another point. 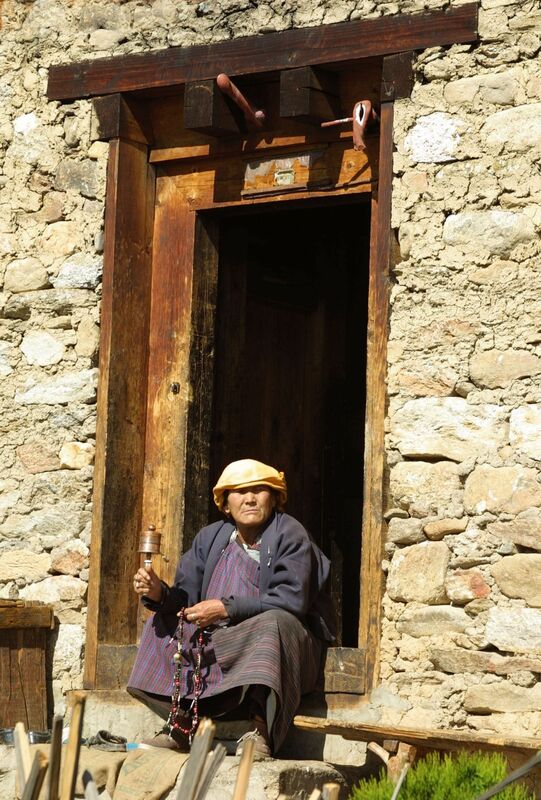 While Bhutanese craftsmanship is colorful, it is definitely primitive. Over and over we saw the evidence of shoddy construction; things simply did not fit. They have clearly not heard the old adage about measure twice and cut once. We're not sure why the quality of the work is so haphazard, but it is. On the other hand, their fabrics are beautiful and their decorations flamboyant. 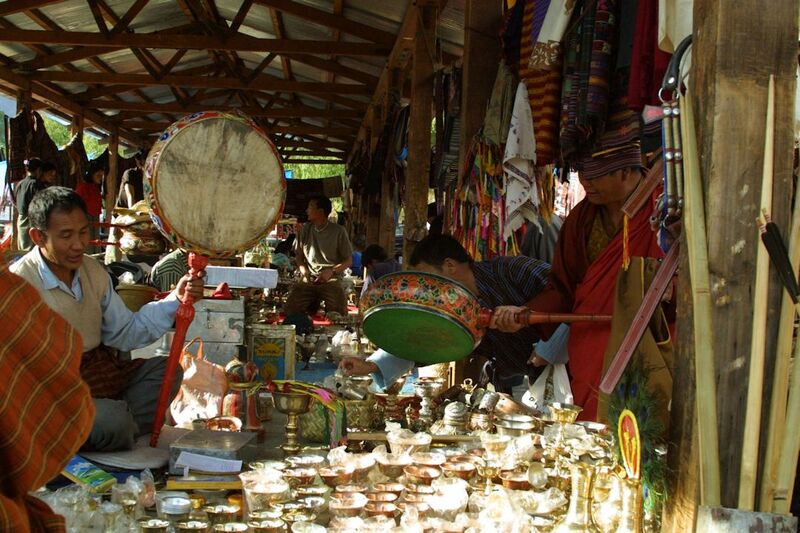 Most of the shop owners were Tibetans and they were not big on negotiation. And, while pork is a popular meat, we never saw a pig. We did see a lot of chickens. Cows, as you might expect, were very common and the people do eat a lot of cheese. Both men and women tended to have fairly short hair but we saw no barbershops. After our morning climb to Tiger's Nest, we packed up and headed for Thimphu, the capital. Our hotel in Thimphu was certainly adequate, just as the one in Paro had been. And we were also warned by Sim Drup not to expect the food anywhere else on the trip to be as good as in Paro which was true. Don't expect elevators in the hotels or such amenities as shampoo or hair dryers. But, we had no problem exchanging money as long as we were not in a hurry. We left $200 with the assistant manager who apologized that the manager was at a cricket match so he wouldn't be able to give us our currency until later that day. There were no ATM's when we were there, so take US$ to convert. Now, as to the hotel. First, we had some considerable difficulty getting the toilet to flush. Then we couldn't get the room to heat up so eventually we had to have them bring in two electric heaters. We had brought a laptop to upload our digital photos and so we needed electricity to charge the camera's and the computer's batteries. However, we couldn't get our plug adapters to work so we had to wander around town to find one that would work. Now walking through downtown Thimphu is something of an experience. First, it was Sunday. And, apparently, that is the day off for the Indian workers because they were standing around everywhere. How can you tell they were Indian? Because they were not dressed in the Bhutanese national outfits. It was also very disconcerting for Katherine, a blond, to walk through them because they would stare unabashedly at her; blonds are not common in India. The other thing you notice is the dogs. They were everywhere both singly and in packs. And obviously many were not well taken care of as we had noted in Paro. Be prepared for seeing some disturbing sights. There are also no signals in the city, or for that matter, anywhere in the country. But there is one traffic control officer in the middle of the main intersection with white gloves and a whistle. There were few tourists, and all seemed to be American. 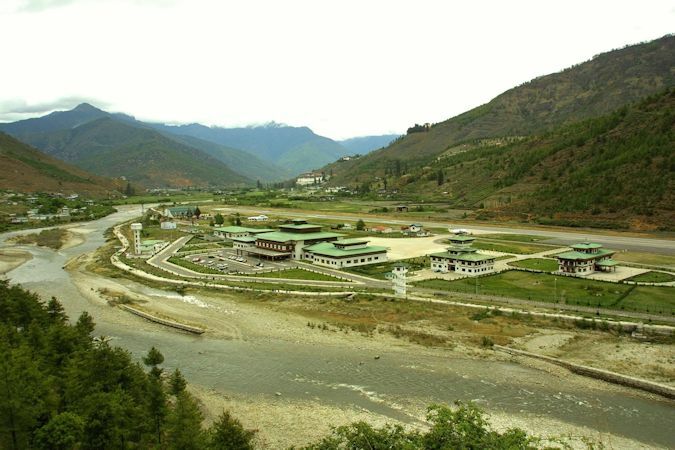 Thimphu is not what you would call a majestic capital. It is clearly a large city by Bhutanese standards, but it was just another big city. It has a market near the center of town, which was very interesting, and some fields used for competitions. Indeed, it turned out that they were having a major archery championship while we were there. 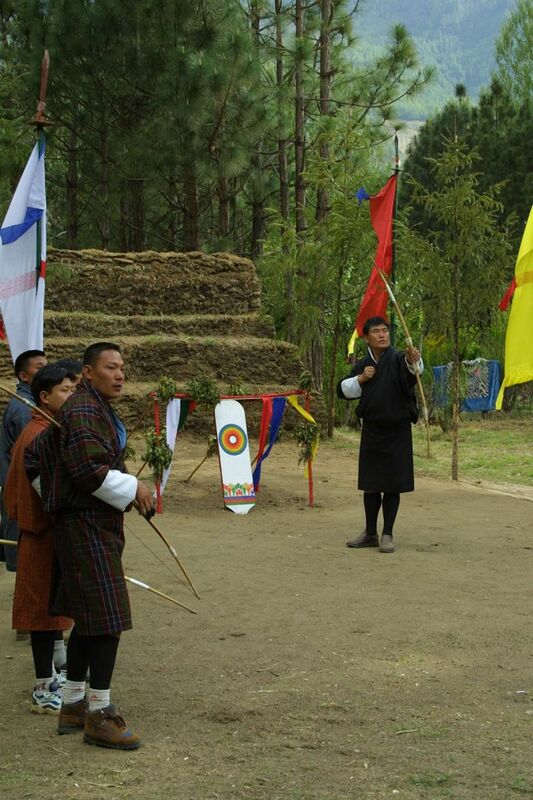 Now, archery is the national sport and they take their competitions seriously. They use a simple bow, none of the fancy, high-tech archery stuff. It is also a lot more entertaining than watching a normal archery competition which has to be duller than watching boat racing. First, it is played and scored much like horseshoes. Each team has half of its members at both ends of the field. And, there are points for closest to the target and so on. And, team members encourage their teammates while taunting the other shooters from the opposite ends of the field. They also do a great victory dance when they do score. It was quite entertaining to see them prancing around in their colorful bathrobes. The big difference is that few people get killed playing horseshoes. With these archery competitions, the competitors, who stand right next to the targets, and the spectators, who are very close, occasionally get hit by an errant arrow. We kept our distance. Despite its smallness, there were quite a few restaurants. But, given that food was included at the hotel, we only went out once and it was great food. Bhutan has no fast-food restaurants so, thankfully, we were spared any McDonald's. On the other hand, it did have a Hallmark card shop, two liquor stores, such as they were, and a theater. When you travel in a country that doesn't do much drinking and doesn't eat a lot of meat, you make sacrifices. Well, it doesn't take long to see downtown Thimphu. 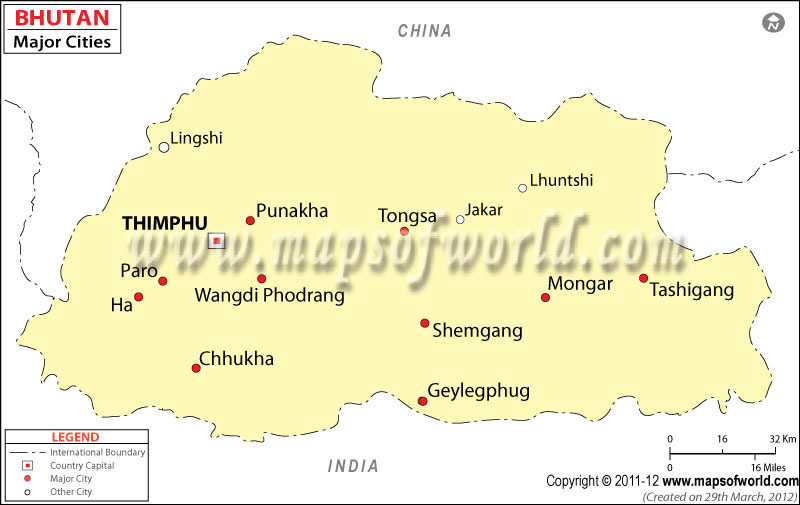 Thimphu is a lot smaller than Kathmandu, and a world cleaner. Actually, the whole country was very clean, no matter how far into the country we got. I should point out that there was a market on Sunday that was worth visiting. Actually, markets draw Katherine like a magnet so we always try to get to them. And, we bought a drum. Mike had seen a monk negotiating for one so figured it was a collectible item. Mike then got Sim Drup to try to negotiate but to no avail, as the monk found out. We did get a lot of pictures of the locals while wandering around. The next morning we left for Punakha, some 77 km, and three hours of driving, away. First, as became the case on just about every day of travel, we would spend hours driving up to a pass and then hours driving down to the next village at the bottom of the valley. However, the scenery was rarely boring with flora continually changing and a river always at the bottom. You actually progress through many ecosystems as you go over passes. One of the advantages of traveling by ourselves is that we could have the driver stop anywhere we wanted so we could take pictures. We listened to Bhutan Public Radio every day we traveled which offered an eclectic mix of one hour of news in English each morning, popular western music, health tips and so on. It was quite entertaining, actually. There is a temptation to think that because you will be coming back the same way you went in you could get the picture on the way back. Don't do that. You never know what the weather will be like as we found out. Indeed, cloudy weather kept us from getting far more pictures than we might have taken. A tip. As you head out from Thimphu and see a pretty picture but are unable to stop for whatever reason, note the mileage marker so that on your way back you will know where to stop to get the picture. On a number of occasions as we drove along, we saw piles of rocks along the road progressing from piles of small boulders to piles of fine gravel. Then we saw the Indian women and their children sitting by the side of the road gradually crushing the larger stones into ever smaller sizes with a hammer. They would take boulders broken lose in working on the road construction and methodically break them down into gravel that was then used to pave the road. It must take them weeks to do what one stone crusher could do in a day. They were apparently the wives of the men doing the construction. We also saw very little construction machinery anywhere. What they did have was primarily used to clear landslides that had closed roads that needed to be cleared quickly. The hotel Dragon's Nest in Punakha, was a lot better than we expected. It was set beside the river and food and rooms were just fine. Here, the other hotel guests ate very conventional buffet food while Sim Drup made sure we got our local dishes. By contrast to the dinners, breakfasts at every hotel were very conventional western style with eggs cooked to order. But our big find was that the hotel had a nice Cote de Rhone wine in stock. So, we bought half his supply and hauled them along on the rest of the trip. Another advantage of traveling by yourselves. 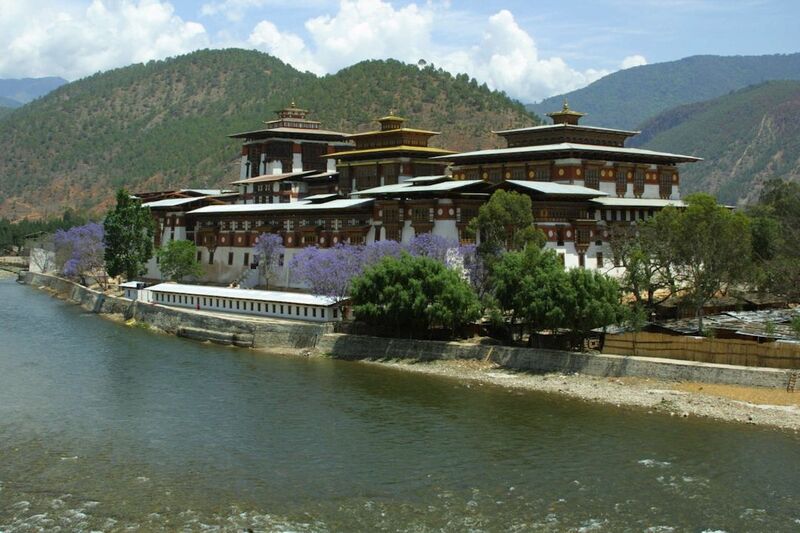 The Punakha Dzong was beautiful. Situated at the fork in the river a short drive from the hotel, it was set besides blooming jacarandas. They also had some magnificent Buddha's and lots of colorful monks. While many consider it to be the most beautiful Dzong, we felt the Trongsa Dzong, which we were to see next, was the most spectacular. Leaving Punakha to go to our next stop, Jakar, we stopped at Wangdi (or Wangdue) Phodrang, or Wangdi for short. This little town is 13kms from Punakha. The Wangdiphodrang Dzong and its small town are perched on a hill between two rivers and we stopped in the market area to refuel. We walked around and ran into a bunch of children just heading into school. We clearly disrupted classes that morning taking pictures. One of the instructors had to come out and tell us to move along so they could start classes. This journey was an introduction to the drives of the rest of the trip. Back up to a pass and then back down. And every time we began to think that the road couldn't get any worse, it did. The problem for Mike was when our van had to pass on the outside. You'd look out the window and there was at least a three-mile drop below you. Certain death, Mike figured. If you are inclined to acrophobia, sit on the same side as the driver. You will always be the farthest from the edge. This trip also reminded Mike of what he had discovered in one of the long drives in northern Vietnam. First, as you are making an uncomfortable drive along a bad road that seems to take forever, you keep wondering when you will get to where you are going. Then, suddenly, you have the realization that you are coming back the same way. Which means that you have all the bad road to do all over. And you recall this thought every mile. Finally, some four hours into the trip, having crossed the first pass of the day, we stopped at Trongsa for lunch. The weather was still good and the views of the Trongsa Dzong coming into town were spectacular. However, while the Dzong always remained tantalizingly close just across the valley, it took us another hour of driving to actually get to Trongsa. The roads were cut through soil that was a mix of sand and granite and there was evidence of many landslides along the way. The good news was that in this particular drive we met only a couple of oncoming cars. We also never saw any road kill, but then at the speeds we were going, between 15 and 30 mph, any animal could easily outrun the cars. Actually, the biggest road hazard we faced was wandering cows and their calves and an occasional Yak. 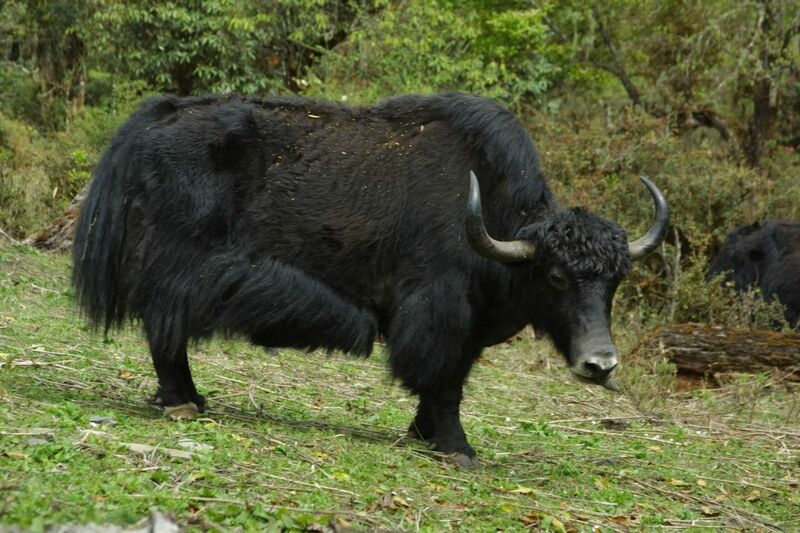 We had never seen a Yak before and so were waiting with great anticipation the sighting of one. So, when we did see one by the road we got duly excited. And the driver stopped and we got out to get some pictures. But, after seeing a variety of them by the roads and up on the hills, Mike was disappointed to find out that they are herding them. It wasn't like seeing some rare animal. They are little more than a hairy cow. Katherine never tired of seeing them. The trip to Jakar took more than 10 hours, crossed a 12,000 foot pass, and for the last six hours after leaving Trongsa, was in a light rain. As with all such trips, you are really looking forward to getting to your hotel so you can have a drink and get cleaned up. We arrived, exhausted, in the rain to a small hotel just above the town with eight rooms. Each had a keyed padlock on the door and a potbellied wood-burning fireplace which you had to light and tend yourself. And there was standing water on the bathroom floor. The standard Bhutan bed had rock-hard pillows and it was cold. We were not happy. And one of our neighbors was also not so happy about the arrival of tourists. It turns out that Rainbow Tours & Treks had booked us at a nicer place but the Bhutan Tourism Corporation had appropriated our rooms that day to accommodate their tour. This, we were told, was a common occurrence. Blackouts were common and we had to use the candle on the table that evening. But the real trip was when Mike awoke, freezing cold, at 2:30 in the morning and had to rebuild the fire. Now that was a first. Mike had to set the firewood in the stove, dip one piece in the can of kerosene, light it, and place it strategically in the stove. 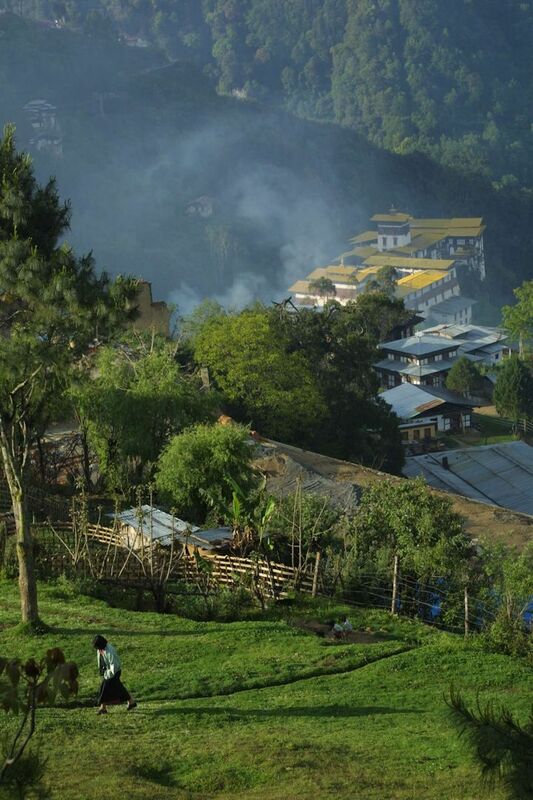 Think of going to Bhutan more as a camping trip and expect all of the discomforts you would expect camping. It will make what you get a lot easier. We spent two nights in Jakar. 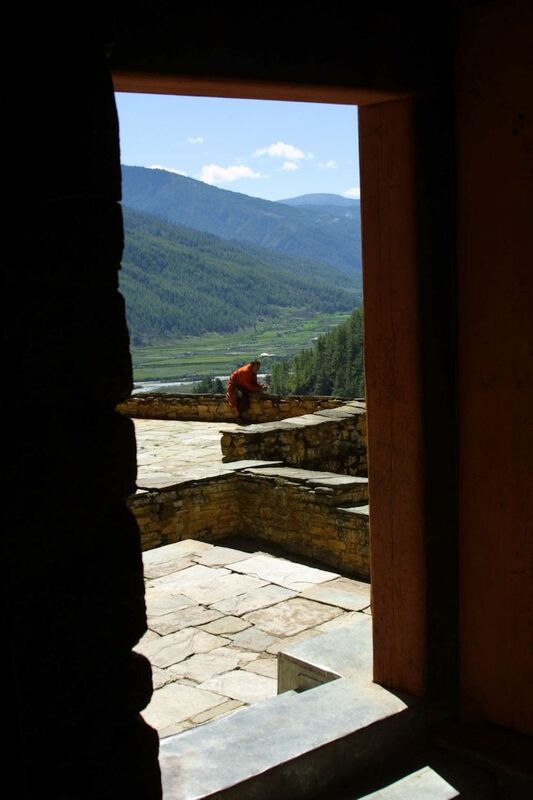 The Bumthang Valley is beautiful and there is lots to see. 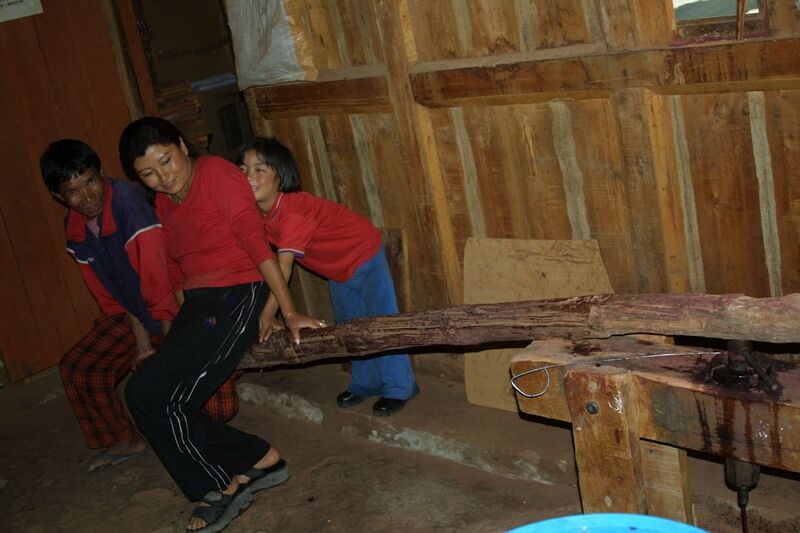 Unfortunately, one of the side trips our guide suggested we take was to the Ura Valley and a visit to an Ura Village. After several hours of driving we were rewarded with a very small and very undistinguished village. Skip it. But the highlight of the trip was a visit to our driver's parents' house. Well, Jakar was the end of the trip. Now, all we had to do was make a U-turn and go all of the way back to Thimphu on the same road. We were scheduled for three nights there but, given our accommodations, decided to leave a day early. We also wanted to stop at Trongsa overnight to make the trip back a little less onerous. Fortunately, Rainbow Tours & Treks arranged this with no problems. 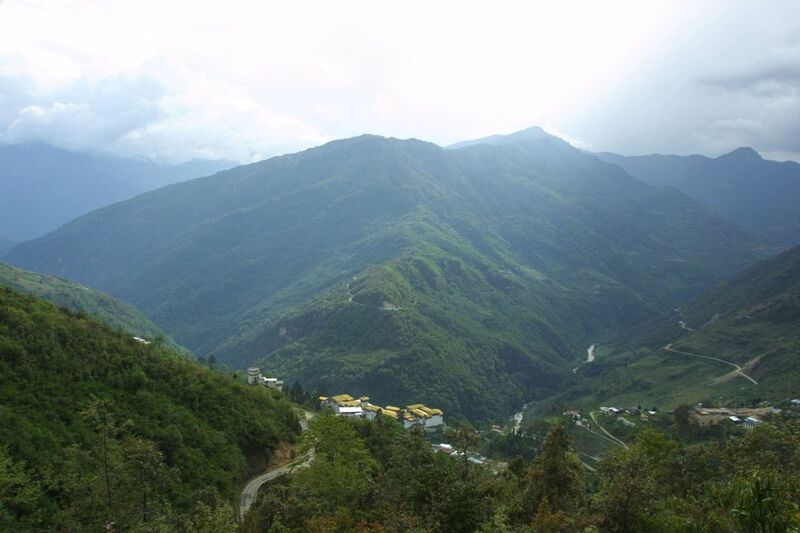 We would strongly suggest you stay in Trongsa overnight. It is that beautiful. And the hotel was actually just great. The next day we made it from Trongsa to Thimphu in one day. That was a very long day. At the time we were there, the culture had been fundamentally unchanged for centuries. One year earlier the government changed the law to allow TV, VCR's, and Internet access. They even have Internet cafes. Indeed, one of our hotels was putting in an Internet room to accommodate the international guests. And we are certain that this change will accelerate. The western influence is appealing and pervasive. Bhutan is also the home of the blue plastic tarp. They were everywhere. As were babies, although we never saw people holding hands. Phallic symbols were displayed everywhere although you don't always realize it until you look closely. Their basic musical instruments are a kind of one string banjo, cymbals, and a flute. Unfortunately, there is only so much you can do with these instruments. And, there were a lot of hitchhiking monks. They were clearly upset when we failed to offer them rides but our guides said that giving them rides meant that you would give them all a ride to wherever they were going. 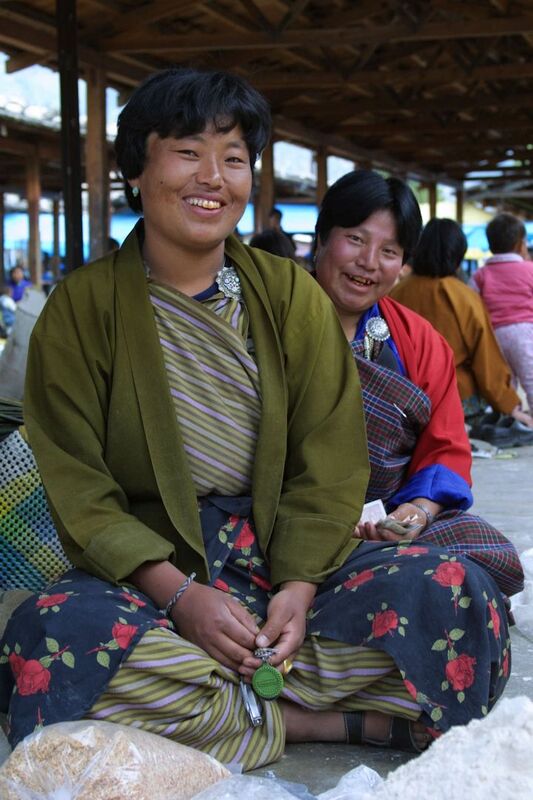 When eating by themselves, our driver and guide ate with their hands, which is typical of the Bhutanese. And they politely refused the handiwipes when we offered them to them. They did like Tic Tac's which we shared with them throughout the journey. They couldn't have been nicer, or more accommodating guides. Indeed, everybody was very friendly. We also loved their toast: Tashi Delek, may many good things come to you. 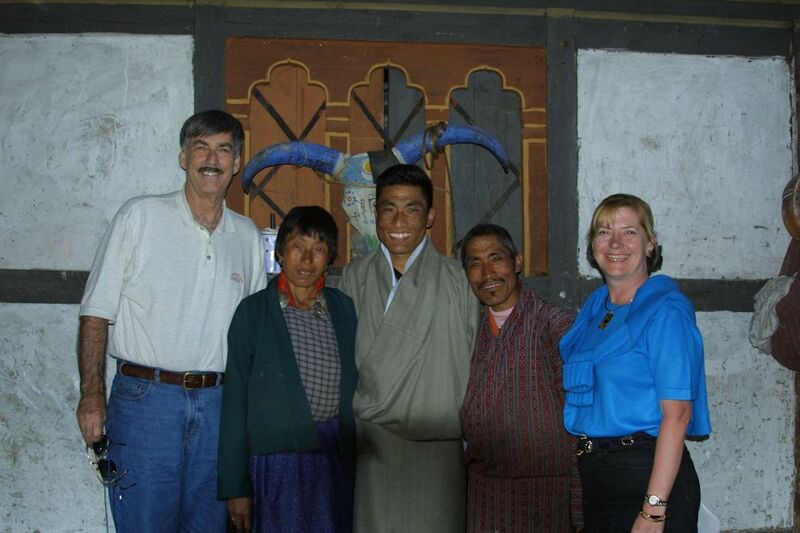 Talking with people we meet along the way, we discovered that you could meet the child Lama, Rinpoche, in Thimphu. So when we got back to Thimphu, we had our guide set that up. But we must walk up the hill to his Dzong. Just how long a walk was this, we wanted to know? A short distance, he assured us, and it was not going to take long. Well, after an hour's hike up a steep mountain, we came upon the Dzong of the Lama, nestled into the mountains. We got an audience with him but we were not allowed to speak directly to him nor take his picture. But he did bless us. Very interesting and worth the effort. We also heard about a visit to an incense manufacturer in the city and had our driver take us there. The lady saw few tourists but gave us a delightful tour of her facility. We would both recommend the incense factory over the many other tours suggested. But it is too small for any but a few people. Fortunately, during the entire trip we never got carsick. First, we tended to be going very slowly but basically, we were too scared to get sick. Many sayings came to mind. 'Start early, arrive early.' 'Life is short, Live.' And so on. And, all of the children we passed waved to us as we went by. There are a lot of Kodak moments here. Make sure your driver stops for a few. They are a friendly and curious people. The children, particularly, were very interested in us. In fact, this was the first trip Mike had made with his digital camera switching from the film-based Canon he used on the other trips to Canon's new digital camera. What Mike found using this camera was that taking a picture of whoever would let him, which were usually the children, and then showing them the picture in the view screen made everybody a ham. Getting pictures after that was easy. Unfortunately today, with everybody toting digital cameras or phones, the locals are not dazzeled by seeing themselves on the display. Lonely Planet was the bible for this trip as there are no other guidebooks. The trip made independent travelers like ourselves uncomfortable because so much is out of your control. You have little to nothing to say about where you will stay, what you will eat and where you will go. Many of the people we met were on treks, as they were in Nepal. Clearly, it's a beautiful place to trek but if you have limited time, you are giving up cultural opportunities for walking. Some tips. You will have a lot of time in the car or van or at the hotel in the evening so bring something to do. Mike took notes but, because of the washboard roads, had a lot of difficulty reading what he had written. And finally, even leaving was eventful. First, on arriving back in Thimphu, we discovered that one of their two airplanes had been damaged. It seems that one of their maintenance workers had totally ignored procedures and driven one of the two planes into a hangar. Now these are not your everyday planes. It seems that they had to go to Germany to get parts. So, up until we actually boarded the plane two days later we were not sure if we were going to leave. And then in passing through Calcutta, we were informed at the airport that the plane was too heavy. So they were simply going to run the engines a while to use up some gas. This was a little distressing. And then we took off with a thunderstorm between us and Bangkok forcing us into a major rerouting. But the light show was interesting. It was never dull. All of the travel books tell you to come during the festivals. However, we agreed that April or May was the best time to go. First, there were relatively few tourists. Second, there were beautiful flowering plants everywhere: rhododendrons, strawberries, cactus, Jacarandas, and apples to name a few. And the temperatures were very mild. On a more basic level, travel on the roads, difficult under the best of conditions, slows down considerably when the roads are heavily traveled during the festival times. The reality is that during the festivals you are going to be hard pressed to get close enough to see much anyway. On the other hand, the rice paddies will be beautiful in the summer and the fall foliage should be beautiful. For obvious reasons, we would strongly discourage you from going anytime during the monsoon season. We would highly recommend Rainbow Tours & Treks. We got to know Soenam, the owner, quite well and had a lovely dinner at her house. Our driver and guide catered to our every whim. And this included stopping anytime we saw a picture we wanted. Again, the benefits of traveling by yourselves. Sim Drup was a wealth of information. Mike was embarrassed all the time forgetting which Dzong we were going to visit or which deity had lived there. But, when Katherine checked his facts he was spot on every time. And Ten Zin was a terrific driver. They made this a great trip.